A family in Mozambique saved up for 3 years to buy a roof for their house. Then they saved up for another 2 years for a bike. If anyone has 1hr to spare, please watch this very important documentary about world population growth by the very eccentric Professor Hans Rosling. He displays an important graph which, depicts the wealth gaps of the world population. Each golden person represents 1 billion and in this world today we have 7 billion people on this planet. We have 1 billion of the population who comfortably earn at least $100 per day, then we have the middle billions of people who make at least $10 a day then we have the poorest billion of people who make $1 a day. They are classed as Extreme Poverty, defined as struggling to provide food for your family. 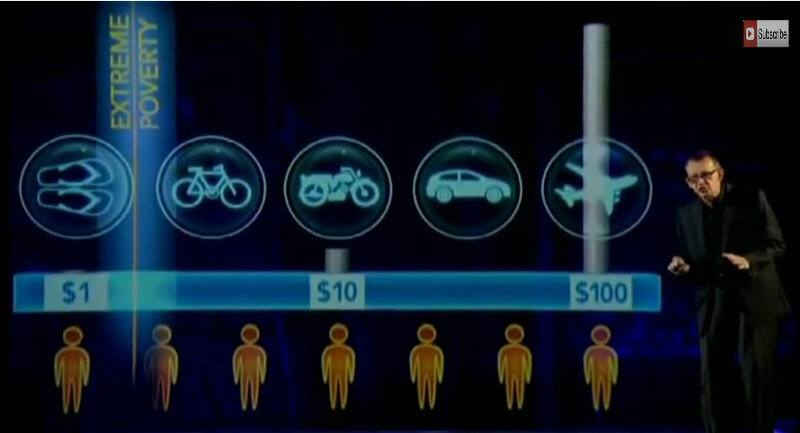 One interesting point Professor Hans Rosling points out is that when people who earn $100 per day look down on the people who make $10 or $1 a day, they may think it’s the same level of poverty. However, if you are in the Extreme Poverty pocket of people and you look up to the billions of people who earn $10 a day, it is a remarkable difference in their quality of life. Whenever and wherever we can, Bikes 4 Life will continue to lift people out of Extreme Poverty.